The lanky former college basketball player and father of two speaks quickly, with remarkable energy in the face of daunting challenges. "Thanks to the stimulus package, we have the chance to save literally hundreds of thousands of teacher positions. This is a huge, huge deal," he said, citing a University of Washington study that suggests 600,000 teachers could be lost this year without drastic intervention. "We're going to be able to avert maybe not all of those cuts but a huge percentage of those, and that's very very important," he said. "If teachers aren't making it, we want to support them and help them develop, but ultimately if it's not working, our children deserve the best," Duncan said. "They probably need to find something else to do." Duncan also is pushing for new benchmarks that would use international standards to compare American students with those overseas. He faults No Child Left Behind for standards that he said don't accurately monitor some children's progress. "When you're told you're meeting those standards, you think you're doing OK. You're really not," Duncan said. "Our children are not competing for jobs down the block or in the district or in the state -- they're competing against children in India or China, and they need to know how they stack up." 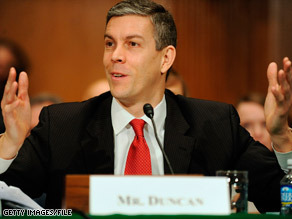 Carey said Duncan's efforts to meet Obama's education goals are an immensely complicated task. "There are 50 states, there are 14,000 school districts, 90,000 schools, and Secretary Duncan is responsible for every one of them. But they all have their own ideas, their own funding sources, their own local leadership," Carey said. Duncan said he feels "a real sense of urgency" to implement national education reform. "Our children in this country have one chance at education. One chance. We can't wait. We can't wait seven or eight years. We'll lose a generation of kids," Duncan said. "And so we have to get better; we have to get better now."